Spring is in the air as chefs are set for a menu change, showcasing the freshness of the season with shoots, greens, and ocean catches. Such is the occasion to be creative, as chefs from Hong Kong, Macau, and abroad gather to present unique and exclusive showcase of techniques while highlighting the best of the new season. Here are five guest chef experiences you should mark your calendars and book early. What: After a series of sold-out four-hands dinners featuring Asia’s most celebrated chefs including Margarita Fores, Tam Kwok-Fung, and Julien Royer, Vea’s Vicky Cheng is presenting his new culinary collaboration with chef Bongkoch Satongun of Paste in Bangkok. As true believers in recreating the true taste of their respective cuisines, chefs Cheng and Satongun will present two nights of their signature dishes, including watermelon with ground salmon, fried shallots and roasted galangal powder; smoky Southern yellow curry with Australian spanner crab and hummingbird flowers, as well as warm mackerel, a crossover dish co-created by the two chefs. The Vea x Paste four-hands dinner is priced at HK$2,180 per person. What: Celebrating the crossover of culinary talents between Hong Kong and Macau with an ode to Chinese cuisine, chef Vicky Lau of Tate Dining Room & Bar is set to present her innovative gastronomy with Wilson Fam and Angelo Wong of Yi at Morpheus, Macau. Both winners of T.Dining Top 20 Restaurant Awards in 2019, the trio will showcase their contemporary takes on their tribute to Chinese cuisine through an exclusive eight-course collaboration menu, presenting signature such as Ode to pate en croute (abalone, pork, and Chinese mushrooms accompanied with green asparagus and black garlic), wok-fried lobster and braised rock rice with truffle, as well as Ode to red fruit (crispy yoghurt meringue with blueberry sorbet, lavender white chocolate mousse). The exclusive two-night crossover menu is priced at MOP $1,888 per person, with an additional MOP$ 600 optional wine and tea pairing available. What: For three days this month, chef Eric Raty of Arbor is joining forces with chef Noboru Arai of Japan’s Hommage in a four-hands collaboration. Together the duo will highlight their strong respect for nature and seasonality while adopting elements from both Japanese and French cuisines in a unique crossover. Raty and Arai are presenting an exclusive four-course lunch menu, priced at HK$1,288 per person, as well as a nine-course dinner menu at HK$2,888 per person. What: Capturing the essence of Kyoto’s nigiri sushi, chef Akira Umehara of the ancient Japanese capital’s Sushidokoro Man is presenting his mastery skills at Royal Garden’s Shikigiku. Celebrated for his wealth of experience and expertise in mastering the art of sushi making, Umehara’s emphasis on premium ocean harvest driven heavily on seasonality, as reflected in his signature selection of sushi showcasing abalones, red snapper from Honshu, Kyushu shrimp, and Hokkaido sea urchin, as well as highlights of the dinner menu including Hokkaido botan shrimp with caviar and sea urchin; Honshu Spanish mackerel and tilefish, as well as ice cream with sakura gelee as dessert. 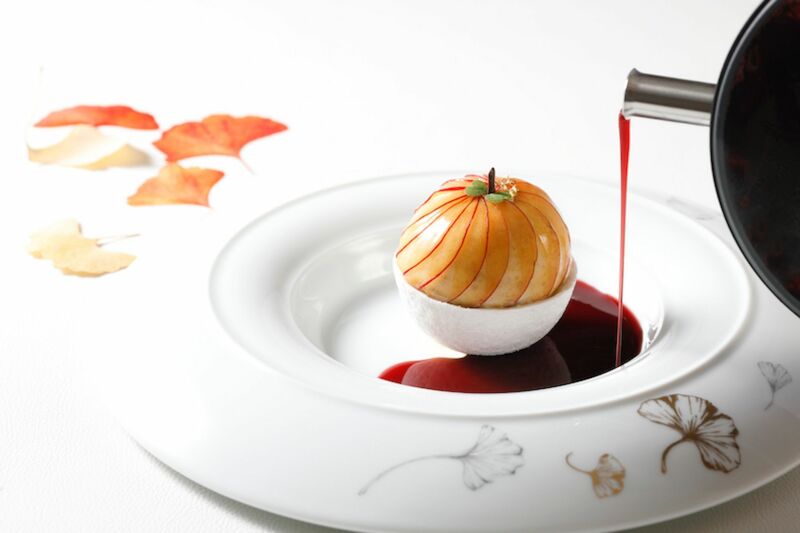 During the five-day culinary showcase, Umehara will be presenting a lunch menu, priced at HK$880 per person, as well as a dinner menu a HK$1,880 per person, available at Shikigiku.